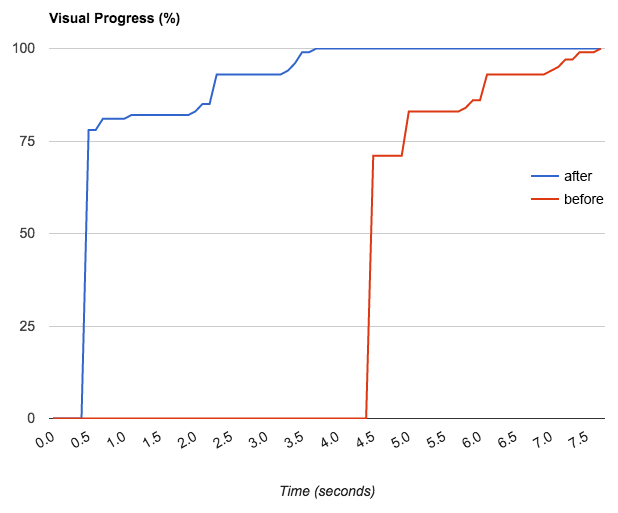 Video: Left hand side shows web performance of optimised intu.io loaded from a browser located in London, UK, right hand side shows the performance of the original page. In between: 4 seconds. intu.io in its present form is almost 5 years old. In the internet, this is a very long time, and we’re almost a bit proud, that you cannot tell the age by looking at the website. 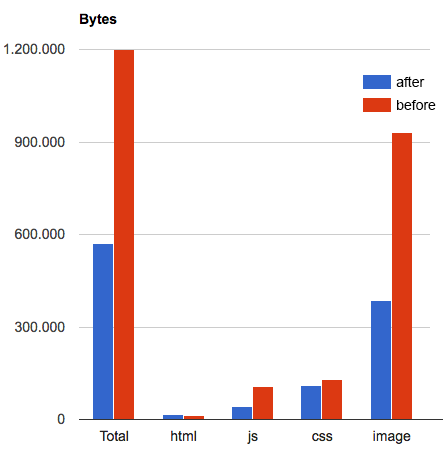 However, we realised there was room for improvement concerning web performance. However, in the meantime a lot of things happened, and since then especially demands regarding speed of web sites have increased. It was about time to overhaul our website in terms of technology and make it faster. The first stops in such an enterprise are Google’s PageSpeed Insights, and WebPageTest. Both confirmed in our test runs that there was a lot to improve: measured from a London-based node, the page took 4.5 seconds before the browser actually started rendering, and PageSpeed Insights gave 74/100 points for mobile devices. After our improvements browsers started rendering after 0.5 seconds, and also Google’s mobile heuristics rewarded the optimisations with 98/100 points. And this is due to only a few changes, which we will explain here in more detail. The first significant improvement targets the server, because every analysis showed very clearly that the Time-To-First-Byte (TTFB), i.e., the response time of the server for the first request was much too high. WebPageTest returned a value of 3 seconds, and tests on-site in Vienna returned a TTFB of at least one second. As long we wouldn’t be able to reduce this value, all other improvements would worthless because browsers cannot do anything without data. Because all static assets were delivered fast, and the DNS request was carried out swiftly, we had the suspicion that WordPress, or PHP respectively, delayed the delivery in spite of caching turned on. With not a lot of dynamic content on the page except our Twitter feed, and due to the fact that we enjoy building Gulp toolchains, our first step was to migrate from PHP templates to static HTML. Although we still use PHP for preparing the Twitter feed we load it asynchronously via AJAX, and insert it into the page using JSON. Therefore, we were able to PHP from the critical path completely. With the result that the first byte from London arrived within less than 300 ms.
Migrating from PHP to a static site reduces the Time-To-First-Byte and the overall web performance dramatically, as you can see in the figure (above: before optimising, below: after). You can see the redirect to the English version of the site. "52e7f683": "Das sagen unsere Kunden:"
"52e7f683": "What our customers say:"
Thus, Gulp generates the english version of the website as static HTML, without having to manage and maintain a large number of keys manually. In case of new or changed strings, the Gulp build warns that the english version is no longer complete. An .htaccess redirect delivers the version of the site depending on the browser’s language setting. Fonts are more complex, because the do not have a built-in mechanism for asynchronous loading while providing intelligent fallbacks. This will change in the future with the font-display descriptor, but for now we have to rely on hand-knitted solutions. Icon fonts have acquired a bad reputation in the past years, because they are less accessible, and are notoriously difficult to align. Thus, the decision to abandon the icon font in favour of an SVG sprite, was an easy one. All icons receive the class .icon. This class fills all SVG paths with the current font colour, such that the SVG icons blend in using the same colour as the text. Multi-coloured SVGs lose all their colours and require a different class. In order not having to add SVGs to the template every time you want to use them we used the very comfortable sprite approach, which allows to reference images via their ID, and not via their relative position in the sprite. We generated the sprite using icomoon.io. As a disadvantage of this technique, these inline sprites become part of the critical path, even if intu.io uses them relatively far down on the page. Considering that these icons use only a few kilobytes, this is well acceptable. In addition, you can see that the icons in the sprite have a title tag, which holds machine readable information about the content of the image. For screen readers, this icon is not invisible anymore. For this purpose, there are a number of tools, which are able to extract critical CSS based on a predefined fold (the lower limit of the browser viewport). Considered critical is everything required for rendering above the fold. We decided not to use these tools in the redesign of intu.io because the easy handling comes at a price and causes a lot of problems: Usually, they start a headless browser like PhantomJS and analyse, which CSS is effectively above the fold. This restricts analysis to only one browser; Firefox and IE might need slightly different CSS. The tools we looked at for this purpose force the user to reload the extracted critical CSS later a second time in the process of loading the complete web page. This has the advantage that the sequence of all CSS rules remains the same, which eliminates CSS bugs caused by changed style priorities. But it also means that a considerable part of CSS has to be downloaded twice. The code sample includes another performance improvement: if critical.css is loaded as an external resource, a new HTTP request will be generated, which is still is known to be quite expensive in HTTP1.1. For this reason, a part of the gulp tool chain, Gulp-Inline-Source, processes HTML code and integrates all scripts, CSS, and images containing the parameter inline into the HTML template. On intu.io, this applies in addition to the critical CSS also to the SVG logo. 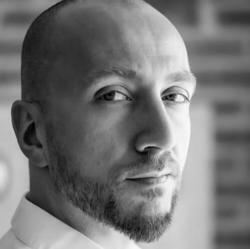 Like this, we merge everything needed for decent rendering of the page in just one HTTP request, and the browser is able to start rendering after less than 500 ms.
A short critical path will display the website quickly to the users, but in real life the rendering process has not finished due to uncritical resources, which need to be downloaded. Looking at this uncritical data you will realise that, for a large part, they consist of images (before and after optimising). To speed intu.io up, it was important to reduce the downloaded image bytes as much as possible. For breakpoints lesser than 37.5ems the browser will load no image at all, but only show a transparent pixel, and lets us indulge ourselves in memories of the 1990s and the spacer.gif. Despite the image only being 1 pixel high, Chrome inflates the picture tag to standard line height of 18px. In addition, the class .hidden-phone also hides the image for small breakpoints, in order not to shift the layout. The example also shows that we are using SVGs in many places because they lead to perfect results and are independent of the device’s pixel density, and usually (not always) are much smaller as the corresponding raster image. This is at least true, if you optimise them with svgo. As with all optimisations also web performance is affected by the law of diminishing marginal utility. 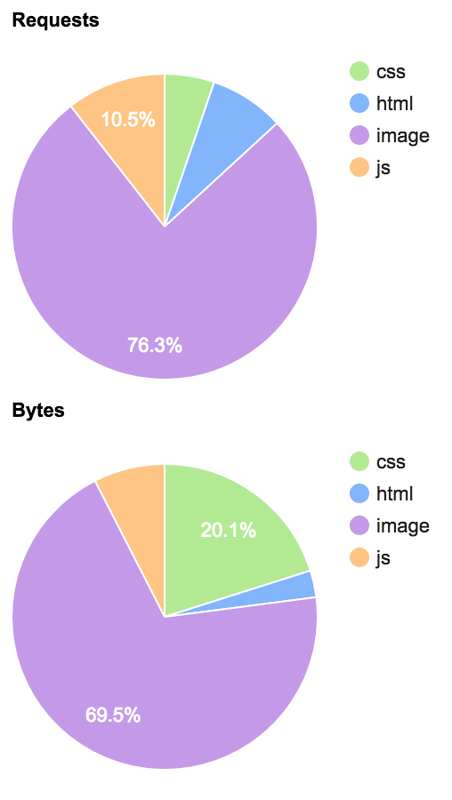 We were able to save almost 50% with CSS optimisation, but the difference measured in kB is relatively small, and therefore has little effect on web performance. Despite of this, we do not want to withhold our optimisations. The first issue are vendor prefixes. We use the SASS library Compass to generate them. On the old version of our site, they have been in the same status as 5 years before, when still a lot more prefixes existed. This was before the idea of the feature flag took hold in more recent browser developments. In order to generate the only prefixes really needed, we delegated this Compass task to PostCSS, and to the Autoprefixer. This CSS processor knows the current status of caniuse.com and produces only vendor prefixes currently needed. Another unnecessary legacy were various workarounds needed for IE8, for which we generated a fallback in pixels for every dimension stated in rem, plus special .no-mq classes, which generated desktop breakpoints for IE 6 to 8. Because IE8 does not appear in our user statistics anymore, we decided to abandon these fallbacks completely. Visual buildup (red: before, blue: after). The buildup is delayed by the use of animations. But in the end we optimise for user experience, and not for seconds. A final word to the PageSpeed Insights, which showed us the major web performance deficits of intu.io before the optimisation. Different to WebPageTest, PageSpeed does not measure real performance data, but searches heuristically for certain characteristics. During the optimisation we realised that these heuristics are not always up to date, especially the desktop version of the test. In contrary to the mobile version, the test still claims that blocking CSS is loaded. Probably due to the fact that the preload trick of loadCSS is relatively new. Even when PageSpeed is a good starting point, for every optimisation there’s no way past hard data and WebPageTest. This tools also reduces its analyses to one number, the so called speed index, which tells us how fast a page reaches its visual completion. For intu.io, this number dropped from 5000 to 911 — a result we are quite happy with. As last two steps, we decided to move to HTTPS/2, which did not result in measurable performance gains, but has rather some impact on SEO with Google ranking the secure protocol higher. The last thing that kept our PageSpeed from jumping to 100, was the expiry time of the font files hosted at TypeKit. Thankfully, they introduced a setting, which prevents the font files to expire as described in their blog article.